Royal Enfield sold 62,630 motorcycles in February 2019, but overall sales are down compared to peak of 71,354 units sold in February 2018. The past month has been something of a challenge for Royal Enfield. Flat or negative growth was noted across most models in the company lineup in India. Royal Enfield Interceptor 650 and Continental GT 650 registered sales of 1,445 units. Exports increased by 49 percent to 2,564 units in February 2019 as compared to 1,723 units exported in the same month of the previous year. Siddharth Lal, Managing Director and CEO of Eicher Motors cites rising input costs, increased insurance and price increase as reasons for this dismal performance which has been felt across the industry. Royal Enfield could also be facing heat from newly launched Jawa Motorcycles in India. Royal Enfield Classic 350. RE has launched alloys as official accessory for Classic ant Thunderbird range. Sales of the Classic 350, the company’s most popular motorcycle, dipped 22 percent from 48,557 units sold in February 2018 to 37,862 units sold last month. Sales of the Thunderbird 350 increased 34 percent from 3,208 units to 4,298 units sold last month. There was a 44 percent dip in sales of the Royal Enfield Bullet Electra Twinspark from 3,304 units sold in February 2018 to 1,848 units sold last month while sales of the Bullet 350 Twinspark increased 11 percent from 11,404 units to 12,714 units. 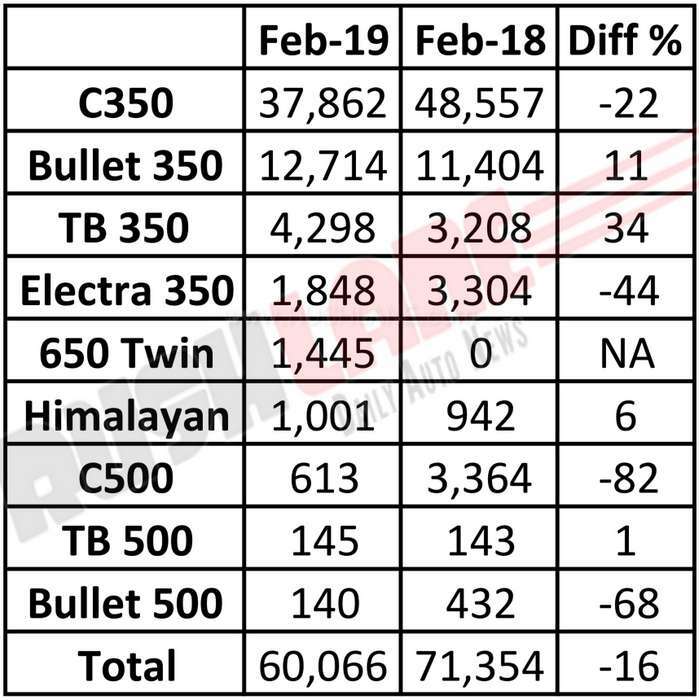 Royal Enfield Bullet 500 sales went down by as much as 68 percent in February 2019. Sales which were at 432 units in February 2018 dipped to just 140 units last month. Himalayan sales increased marginally by 6 percent from 942 units sold in February 2018 to 1,001 units sold last month. Sales of the Classic 500 suffered a significant fall by 82 percent with 3,364 units sold in February 2018 to just 613 units sold last month. Thunderbird 500 sales remained flat with a 1 percent increase from 143 units sold in February 2018 to 145 units sold in February 2019. 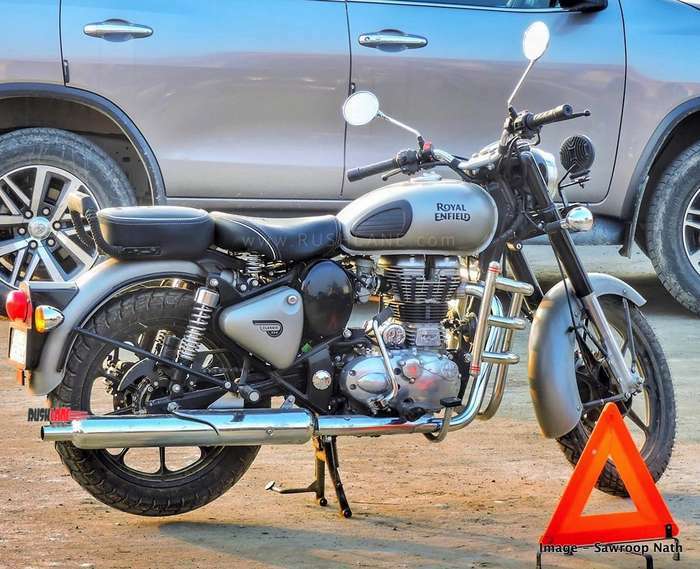 The company’s 650 Twins – Royal Enfield Interceptor 650 and Royal Enfield Continental GT 650 posted sales of 1,445 units in February 2019. Launched at the end of last year, these two models have been well received in India and are positioned as the company’s global products. The 650 Twins command a few months of waiting period in domestic markets and production has been ramped up to meet with this demand both in domestic and global markets.